Everglades National Park, Florida, is pictured above. UNESCO (United Nations Educational, Scientific, and Cultural Organization) started working to protect internationally significant places in 1954, when a prospective dam and reservoir threatened cultural and natural resources along the Nile River Valley in Egypt. The World Heritage Sites Convention, which nominates places to the World Heritage Sites list, was created in 1972. World Heritage Sites range from prized natural resources to reflections of our shared cultural heritage in the built environment, but the one thing all 1,092 sites have in common is their ability to transcend borders and recognize the history of all people. These places matter to everyone, everywhere. 23 World Heritage Sites are in the United States and Puerto Rico. To give you a taste of the incredible places our nation contributes to the greater list, here are four of our favorite World Heritage Sites in the United States. Desert View Watchtower at Grand Canyon National Park features internationally significant American Indian murals. The Grand Canyon is one of the most awe-inspiring and celebrated landscapes worldwide. The canyon also has a record of human occupation stretching back 12,000 years with cultural links to many contemporary American Indian tribes, including the Havasupai, Hopi, Hualapai, Navajo, Southern Paiute, and Zuni. 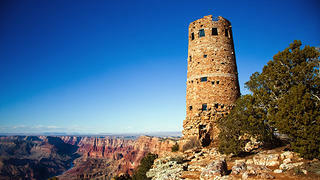 Despite the site’s widespread protections, multiple development proposals once compromised the Grand Canyon’s future, so the National Trust added the national park to our 2015 America’s 11 Most Endangered Historic Places List and named it a National Treasure in 2016., In the years since, the National Trust and our partners worked to eliminate the threats facing this special place. The national park also received a $250,000 grant in 2016 through Partners in Preservation: National Parks to restore the Desert View Watchtower’s internationally significant American Indian murals. 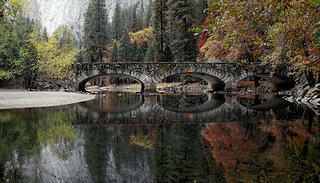 The Ahwahnee Bridge in Yosemite Valley, California. The first park devoted to the protection of natural scenery, Yosemite is framed by the world-famous Half Dome, El Capitan, and Yosemite Falls. Its unique geological features are the result of glacial erosion of granitic bedrock, and its giant sequoia groves create a landscape like no other. The park also has one of the earliest stone rustic buildings in a national park, the Parsons Memorial Lodge. A $97,000 grant from 2016’s Partners in Preservation: National Parks supported needed restoration work at the lodge to reverse damage caused by high elevation weather. Yosemite’s Merced River, one of the national park’s lesser-known resources, includes three historic, rustic bridges, built between 1928 and 1932. The National Park Service was considering removing the bridges as part of a comprehensive management plan for the river. In response, the National Trust added the bridges to the 2012 America’s 11 Most Endangered Historic Places List and named them a National Treasure. In 2014, the National Park Service released a final management plan for the Merced River that did not call for the removal of these significant cultural resources. One of five complexes at San Antonio Missions National Historical Park in Texas. 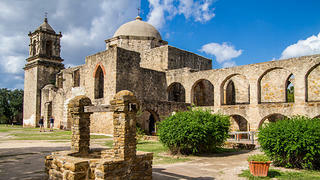 Comprised of five frontier mission complexes along the San Antonio River Basin, San Antonio Missions National Historical Park is a unique blend of Spanish Colonial and Coahuiltecan cultures. Franciscan missionaries settled in the area during the 18th century, planning to colonize and defend New Spain’s border. But instead of assimilating, indigenous people, missionaries, and colonizers participated in a cultural exchange that resulted in a common language and religion that was neither Spanish nor Coahuiltecan. The architecture in each of the complexes, which features Catholic symbolism and indigenous designs, demonstrates the shared heritage of these disparate groups. The missions are part of the larger national historical park and are still active parishes today. In 2016, the National Trust’s HOPE Crew (Hands-On Preservation Experience) worked on various projects at Mission Concepcion, one of the five complexes. Members of the Texas Conservation Corps restored the post-Colonial Tufa House and served as masonry apprentices on iconic structures throughout the park. 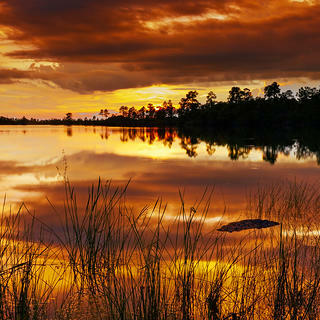 The Everglades is the biggest sub-tropical wilderness reserve in North America. The national park features a variety of marine environments, from freshwater and saltwater marshes to bays and deeper coastal areas along the southern tip of the Florida panhandle. The Everglades are home to alligators, crocodiles, manatees, snail kites, and the Florida panther—a few of the 20 rare, endangered, and threatened species residing in the national park. Everglades National Park received a $250,000 grant through 2016’s Partners in Preservation: National Parks, which went to the restoration of the Flamingo Visitor Center’s exterior (a distinctive example of Park Service Modern architecture and the Mission 66 building program that transformed America’s national parks in the 1950s and ‘60s). While it’s one of America’s most vital natural and cultural resources, the Everglades is the only U.S. World Heritage site that faces specific and proven imminent danger. Major threats to the Everglades include a lack of water control, introduced species, development, and sea level rise. To ensure that all these and other UNESCO World Heritage Sites around the world are protected for future generations, plan a trip to visit and learn more about your favorites! Join us in asking your Representative to address the deferred maintenance backlog facing the UNESCO World Heritage Sites above and other national parks around the country.